We’re on post-PC watch here lately, tracking the many warning signs that we’ve crossed the imaginary line separating PC’s heyday from that of a new landscape scattered with multiple mobile devices; it’s a place where the traditional desktop and laptop computer is seeing decreasing importance. That’s why this new Forrester report on mobile devices in the workplace caught my eye, as it highlights the disruption those devices have caused in the business world, seemingly right under the noses of I.T. Before diving into the data, the report notes that today’s I.T. departments think they have only a handful of devices out in the field: a PC and smartphone for most users, and maybe a tablet for a handful of execs. But in reality, one-half of info workers report using multiple devices, often behind I.T.’s back. Post-PC era? Sounds like it… whether I.T. is ready or not. To determine its findings, the analysts surveyed nearly 10,000 information workers and 2,300 I.T. decision makers around the world. The two groups’ responses indicated a big disconnect in terms of what those in charge of device connectivity think is happening, versus what’s actually happening. Info workers reported using 60 percent of all their PCs and mobile devices for both personal and business use, with only 14 percent used just for work, and 26 percent for personal purposes. The numbers indicate a further blurring of the boundaries between personal time, and time spent working. When I.T. departments were asked how many devices were used in their companies, however, only about a third reported that they issued three or more to execs. A quarter reported issuing three or more to I.T. workers, and fewer to other types of workers. But when workers themselves were asked, over half (52 percent) said they used three or more devices for work purposes. Uh-oh! Some of those are flying under the radar, it seems. So what kinds of devices are these? Well, one-third (33 percent) of all those reported to be in use were non-Microsoft, and one-quarter of them were mobile. (Forrester counts tablets as “mobile,” for what it’s worth). What’s more, Microsoft’s OS share in the I.T. environment will erode over time, as multi-device use becomes more common. I.T. is slow to respond to changes here, even though they’re already underway. In fact, you could say the same thing about employees’ use of consumer-friendly cloud services, like Dropbox, iCloud, Google Apps, Box.net, and others – services which mobile makes even more accessible. In addition, although we’re hearing a lot about BYOD (“bring your own device”) programs in businesses, it’s still a trend in its very early stages from I.T.’s perspective. Employees today are bringing their own devices largely outside of BYOD programs, Gillett says. 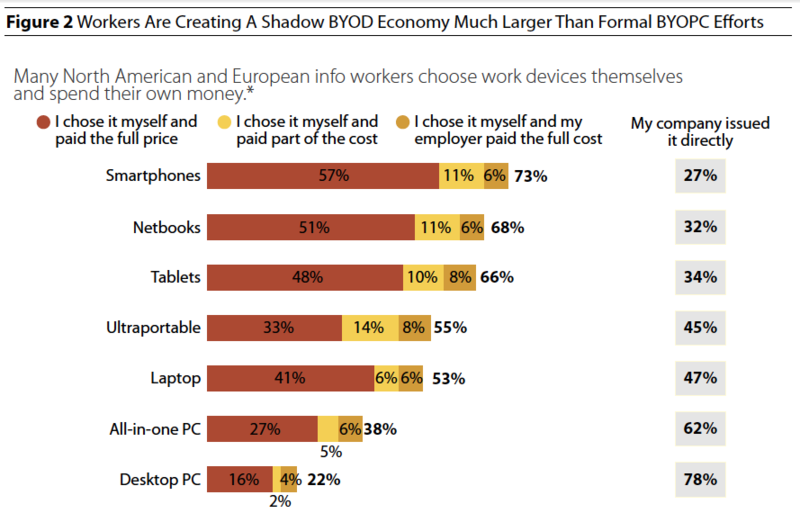 While 73 percent of workers pick their own phone, 53 percent their own laptop, 22 percent their own desktop, and 66 percent their own tablet, significant numbers of workers report paying for the devices themselves. In the case of smartphones, for example, 57 percent report paying the full price for the device themselves, and 48 percent report paying full price for their own tablet. BYOD programs, meanwhile, are still low. Only 6 percent of companies have BYOPC programs in place. 58 percent expect growth in employees bringing smartphones to work in the next 12 months, whether BYOD-supported or not. I.T.’s slowness in shifting policies to accommodate employee behavior is due to the processes which have been in place for years, including how I.T. budgets are handled, the need to streamline operations, the way device approvals have been handled, security requirements put in place for legal reasons, compliance issues and more. Employees dictating to I.T. what they’ll be using now (thank you very much), is also such a new concept that’s it still downright laughable in some circles. Imagine! The users think they’re in control! Ha ha ha ha! Well, surprise: they are. And I.T. is in denial about it. This is only one of many examples of what the post-PC Era looks like, or at the very least, how a transition into such an era begins. And to be clear, “post-PC” doesn’t have to mean “no PC.” Maybe it’s not the best turn of phrase to describe it (R.I.P. Steve Jobs). “Post-PC” is about having more devices, and the PC is not the only one that matters.